I recently took an around-the-world trip from NYC (with a stay at the new Park Hyatt New York) and then on to Tokyo for 62,500 AA miles and $5.60, with award seats on American’s A321 first class JFK-San Francisco (SFO) and JAL’s Boeing 777-300ER first class SFO-Tokyo Haneda (HND). I hadn’t visited Tokyo for a long time, but it took me no time at all to fall back in love with the city during my stay at the Andaz Tokyo. I was then on to Kyoto and a stay at The Ritz-Carlton, Kyoto before catching a Malaysia Airlines business class flight from Osaka (ITM) to Kuala Lumpur (KUL) for a whirlwind, 24-hour trip to the over-the-top capital of Malaysia: Kuala Lumpur. Kuala Lumpur is home to tropical parks and soaring skyscrapers—like the PETRONAS Twin Towers. Photo courtesy of Shutterstock. Kuala Lumpur, or KL as its often called, is tucked between Thailand and Singapore on the Malaysian peninsula. The city’s name means “muddy confluence,” as it’s the spot where the Klang and Gombak rivers meet, but though it began as a tin-mining town, these days the most shiny things you’ll find in this luxurious, cosmopolitan city are skyscrapers and shopping malls. Once you arrive, you’ll instantly feel how dynamic the city is, with its 24-hour restaurants and late-night shopping bazaars. Home to a variety of peacefully-coexisting cultures, you’ll find areas like China Town and Little India, as well as a landscape full of mosques, churches, Buddhist temples and Hindu shrines. What spoke to me most strongly, though, was KL’s passion for food—and the sheer array of cuisines I could order at almost any hour of the day. Kuala Lumpur’s KLIA, the international airport. Photo courtesy of Shutterstock. There are two airports in Sepang: Kuala Lumpur International Airport (KLIA), which is where the majority of international flights fly into, and Kuala Lumpur International Airport 2 (KLIA2), which caters to budget airlines like Lion Air or Air Asia. I found that the best way to get to and from KLIA is by taking the KLIA Express, which runs from both airports straight to the main train station, KL Sentral. The trains aren’t the most luxurious, but they’re reliable, quick and cheap. During peak hours they run every 15 minutes and it’s a 30-minute direct ride into town for only 35 Malaysian Ringgit (about $10 US) each way. Plus, there’s free WiFi on board. Totally beats an hour taxi ride, which would cost at least $40, and the train station is right across from the Hilton Kuala Lumpur and Le Méridien Kuala Lumpur. If you happen to be flying with Malaysia Airlines or Emirates, they’ll even check your luggage straight to the station at KL City Air Terminal, so no need to worry about lugging bags on the train. Kuala Lumpur’s Bintang Walk and monorail. Photo courtesy of Shutterstock. Traffic can be a nightmare in Kuala Lumpur—no surprise here, since it’s a huge, bustling capital. I found the easiest way to take in the sites during the day was to walk, since they’re mostly located in the city center. Skip taxis and buses in the morning and evening when traffic is at its worst and hop on a train instead. Kuala Lumpur Sentral is the main hub for the six rail lines and city buses that run throughout the central part of the city. This is also where you can catch the touristy Hop-On Hop-Off bus, if that happens to be your thing. You can hail one of the red-and-white or yellow-and-blue taxis anywhere in town, but keep an eye on the meter (fares should start at 3 RM or about 84 cents). PETRONAS Twin Towers in Kuala Lumpur. Photo courtesy of Shutterstock. If you’re short on time and can only visit a few sites, I’d recommend hitting up the PETRONAS Twin Towers and Menara Kuala Lumpur Tower, two prominent landmarks in KL. Built in 1996, PETRONAS is the tallest twin building in the world, and you can head up to the 86th floor or walk across the double-decker Skybridge on the 41 and 42nd floor linking the two towers—which form an “M” for Malaysia on the city’s skyline. Since the city is also known as one of the world’s best shopping spots, it’s no surprise the towers are also home to Suria KLCC, six floors of stores and restaurants ranging from designer shops like Chanel and Giorgio Armani to casual wear like GAP and Guess. 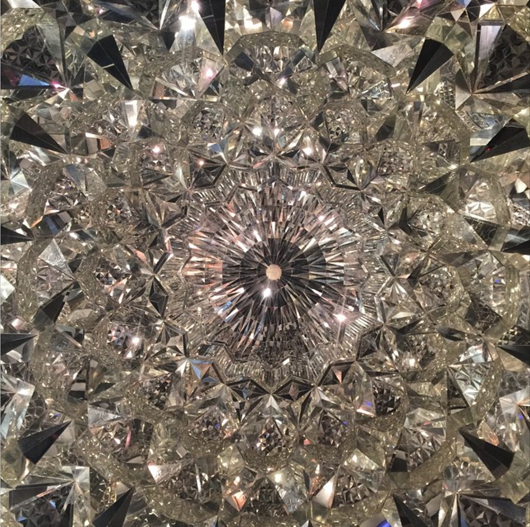 The crystal dome ceiling—imported from Iran—in Menara KL Tower’s elevator lobby. The view from KL Tower, the tallest tower in Southeast Asia, is higher than from the Skybridge and the building is set on a rainforest reserve—pretty cool considering it’s right in the city center. Keep in mind the weather in KL is tropical year-round, but the rainier months are from October to March. If it’s raining while you’re there, you can check out some of the shopping destinations in town like the indoor Amcorp Mall Flea Market on Saturdays and Sundays or the Pavilion Kuala Lumpur in Bukit Bintang, boasting the tallest Liuli crystal fountain in Malaysia and 450 shops. Hindu temple at the Batu Caves. Photo courtesy of Shutterstock. Just eight miles north of the city lies one of the most impressive sites in KL: Batu Caves, a 100-year-old Hindu temple built into a limestone hill. Statues line the inside and outside of the three main caves, which can be reached via taxi or KTM Komuter train from SL Sentral. Climb up the 272 steps for an Instagram-worthy pic of KL’s skyline (plus the massive golden Hindu god sculpture is pretty neat). 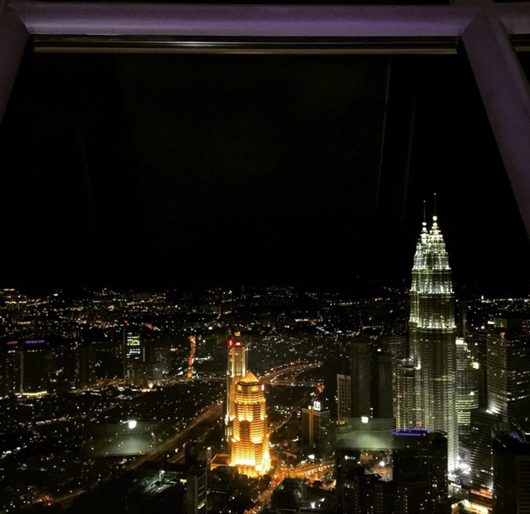 The view of PETRONAS Twin Towers at night while having dinner at Atmosphere 360 in KL Tower. Tourist buffets in landmark buildings aren’t usually my way of seeing the authentic side of a city, but I decided to make an exception in KL and eat at probably one of the most touristy places in the world town—the Menara Kuala Lumpur Tower’s Atmosphere 360. To give you an idea of what it was like, imagine a Vegas-style buffet dinner inside a revolving version of Disneyland mixed with a spaceship, all set beneath a ceiling studded with fake stars. No surprise the food wasn’t spectacular and the atmosphere was 100% cheesy, but I’ll say this: the nighttime view of the PETRONAS Twin Towers from here was absolutely spectacular. Hawker stalls and communal tables in Jalan Alor. Photo courtesy of Shutterstock. I’d suggest skipping this spot in favor of trying some of the mouthwatering street food in town, like the rows of hawker stalls lining the street in Jalan Alor (once KL’s Red Light District), which serve up cheap barbecued meats, noodles, and a buttery flatbread called roti that’s not unlike thick tortillas or Indian nan bread. Street market in Kampung Baru. Photo courtesy of Shutterstock. If you’re looking for purely local fare, head to Kampung Baru (which means “new village”), the oldest residential neighborhood in KL. Amidst traditional wooden houses on stilts that feel worlds away from the city’s urban landscape, you’ll find some of the best Malay food in town, like a mixed rice dish called nasi campur. If you’re in this area on a Saturday, check out the food stalls at the weekly night market. While I was in KL, I stayed at the Le Méridien Kuala Lumpur, so keep an eye out for my hotel review—coming soon! Have you visited Kuala Lumpur? What are some of your favorite things to do while you’re there?